All Saints Catholic School believes that clothes do not define a person. The wearing of a uniform allows everyone to be seen for who they are, not by what they have. 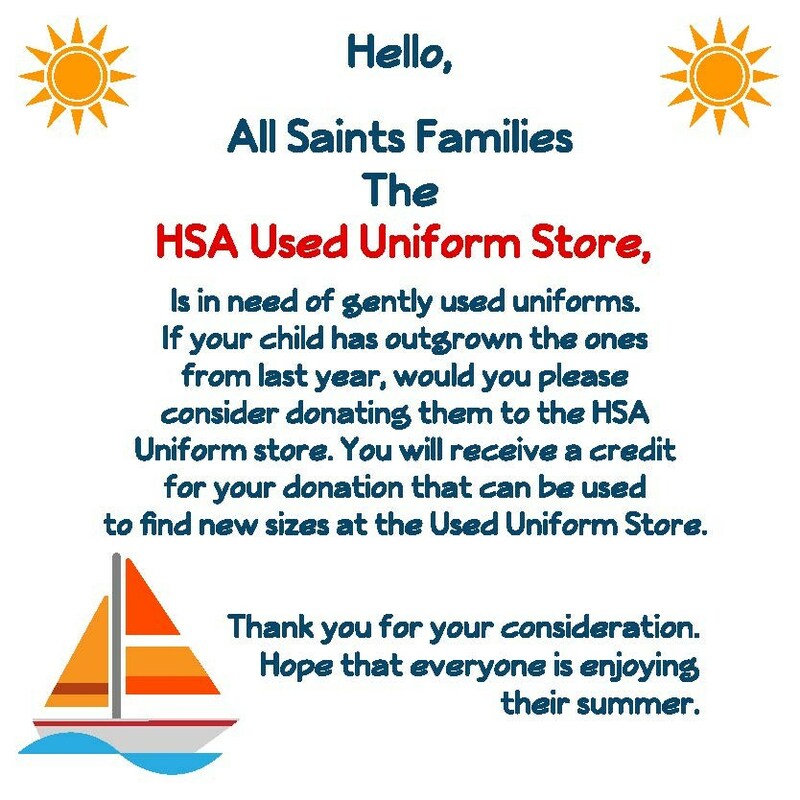 Uniforms are required at All Saints Catholic School and the complete, official uniform must be worn every day unless otherwise prescribed by the administration. Please refer to the information below and to the right for information on our dress code and uniform ordering information. The hair is to be neatly groomed and of moderate length. Bandanas/ kerchiefs covering the head are not permitted. Hairstyles that are ‘bushy” or that entail significant contrasts of longer and short hair, or unnatural contrasts in color, are not acceptable. Hair styles that are extreme or bizarre, or that involve design or architecture are not permitted. Boys: Haircuts are to be traditional and conservative, kept to the top of the neck and above the collar, off the ears and from mid-forehead to above the eyebrows. Girls: Girls’ hair must be off their face. No beads, sequins or unusual hair adornments are allowed. Final determination as to what is acceptable will be determined by the administration. A small, plain cross or religious medal and chain (not just chains) and watch are the only jewelry that may be worn by students at All Saints. The cross or religious medallion must be worn inside the shirt or blouse. Bracelets and ankle bracelets are not permitted. No rings are allowed. Girls may wear small post/stud earrings only (one in each ear). If a girl is allergic to post/stud earrings, then she may not wear other earrings. No other jewelry may be worn. Should a student wear inappropriate jewelry (as determined by the administration), the jewelry will be taken from the student and returned at the end of the day. If a student continuously violates this policy, the jewelry will be confiscated and kept until the end of the year. No waist chains, body piercing, tattoos, counter culture symbols or appearances will be accepted. No tattoos permanent, washable, or student created may be worn. No wrist bands that are inappropriate, as determined by the Administration, may be worn. NO make-up of any kind (including foundation and waterproof mascara), nail polish, acrylic nails, gel/French nails are permitted. Any make-up, perfume, cologne found in school will be confiscated and returned at the end of the day and is not to be brought back to school. Please remove all nail polish and make-up before coming to school. Students are permitted to wear full-length denim blue jeans as long as they are neat in appearance and are not ripped or frayed, and do not have holes worn through them. Students are permitted to wear only approved All Saints spirit shirts or uniform tops. Only uniform shorts are permitted. Skin-tight clothing is not to be worn as part of the uniform or non-uniform apparel. Girls may not wear any clothing the exposes the midriff or any other significant part of the body. Sneakers with socks may be worn. Slipper and boots are not permitted. Due to safety issues, students with backless or flip flops will not be permitted to attend class. No spaghetti strap tanks, midriffs, tube tops, etc. 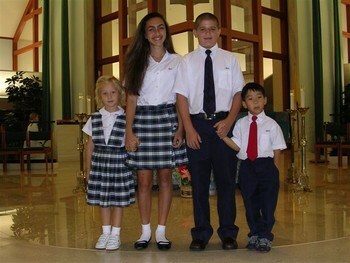 All Saints Catholic School believes that clothes do not define a person. The wearing of a uniform allows everyone to be seen for who they are, not by what they have. 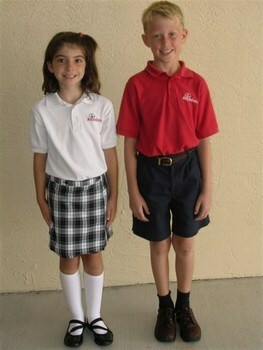 The purpose of a uniform is a means of consistency in student dress, while keeping costs to a minimum. It also reduces the problem of competitive dressing. Students, unless otherwise notified by Administration, will wear the school uniform. 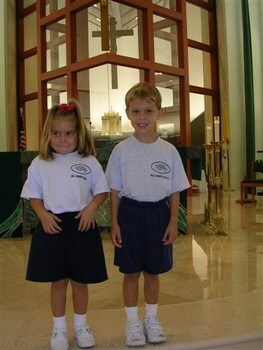 All Saints students are expected to keep themselves well-groomed and neatly dressed at all times. A clean and healthy appearance is important. Any form of dress or hair style which is considered by the Administrations to be contrary to good hygiene or which is distractive or disruptive in appearance and detrimental to the purpose or conduct of the school will not be permitted. All clothing must be clean, neatly pressed, and in good repair. No ripped, torn, or defaced item may be worn. Allowed: Navy blue, brown or black leather shoes. Trim, soles, and laces of a contrasting color are not permitted. Buckle or lace-up style shoe with black no-marking sole, Sperry Top-Siders with no designer contrasting color/ pattern insert. If undershirts are worn, they must be plain white. 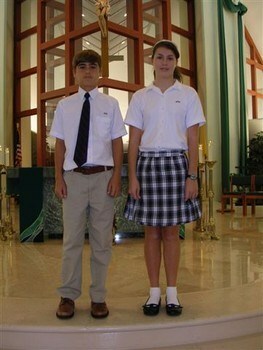 Middle School boys are REQUIRED to wear their ties all day after liturgy. Students must wear Harris Uniform school approved sweaters. Students may wear a non-school jacket on cold days ONLY if there is a school approved sweater underneath the jacket. Non-school jackets need to be removed inside the classrooms, cafeteria, etc. *Because it is impossible to encompass every eventuality of dress and appearance, the judgment of the Administration is final in these matters. Students who are not in conformity with the Code of Dress and Appearance may incur disciplinary consequences. The uniform store open dates and time TBD. The HSA Uniform store is located in Room 110.